Some of you, actually very few of you were here when I preached on this section on the 16th of December 2012. I decided to touch on it again for very obvious reasons. As you know we as a family are working through this trial with Wendy’s cancer. For a few years we struggled with my mother having to deal with Alzheimer’s disease and the challenges that it brought. And even though we felt that she should have left her earthly body much sooner which would have been better for her she only passed away on the 24th of January this year. But trials are not unique to the Coertzes. Many of you are facing trials of various kinds, and some of you will be facing trials somewhere in the future. This sermon is designed to minister to you in that regard and to help you minister to others. Now sometimes trials can be brought upon us by ourselves either due to sin or irresponsibility or plain stupidity. Other times it comes from our enemies – including Satan, and yet at other times it just simply comes from nowhere or maybe even from God. Remember the trials that Job faced. While Satan was central in the deal, it was initiated by God, and came by the hands of the Chaldeans as well as natural acts which we call the Acts of God. I looked at what John Piper did with Habakkuk and he had a very interesting title for his sermon which is “God is never late—but He sure is slow.” Well, then the only answer is the title of my sermon, “Hurry up and Wait’, which you can see in both texts. I am not going to preach on either of the two but want to take us to a simple experience of the disciples of Jesus Christ which we read in Matthew 8. The message of Isaiah is ‘wait’, the message of Habakkuk is ‘wait’ and the message of Matthew 8 is ‘wait’. But we all grew up with the idea that God’s promises are “100-percent-guaranteed lifetime-warranty, you-must-be-completely-satisfied-or-your money-back, over-night delivery promises.” Don’t we sometimes just wish that God has an overnight service delivery called ‘Heavenly Express for Christians’, as long as we get our prayers in before 15:30 in the afternoon? The name it and claim it guys sure seem to teach that. Look at the story of a leper. Matthew 8:1-3 (ESV) 1 When he came down from the mountain, great crowds followed him. 2 And behold, a leper came to him and knelt before him, saying, “Lord, if you will, you can make me clean.” 3 And Jesus stretched out his hand and touched him, saying, “I will; be clean.” And immediately his leprosy was cleansed." Even mother in laws can be healed immediately; even though some son-in-laws believe they are still a pain. Matthew 8:14-15 (ESV) 14 And when Jesus entered Peter’s house, he saw his mother-in-law lying sick with a fever. 15 He touched her hand, and the fever left her, and she rose and began to serve him." I remember being on the Sea of Galilee when a storm was brewing and we had to get off. The disciples were not afraid for no reason. These were seasoned fishermen who spent most of their lives on the Sea and understood its quirks. The lake is 230 meters below sea level surrounded by hills. So, when warm air of the day cools and rushes down the ravines it creates a whirlpool effect which can be scary at the best of times. A clear, calm night can suddenly turn into a violent storm. And so they face this storm and what is Jesus doing? He is fast asleep. Is that not how we often feel? Here I am facing my storm and Jesus is asleep. It is the most natural thing in our lives to want to set a deadline for God’s answer for me, but sadly God more than often ignores it! Why? I guess there are many reasons, but let me give you four. I believe that there is a reason why all these other instant healing stories were told before this one. It shows us that these big miracles do not necessarily build our faith. Remember the app. 20000 people who were fed from 5 loaves and 2 fish. You could not wish for a greater miracle. The very next day they are back at Jesus, not to worship Him, but to get their bellies filled. Let me give you a super miracle. Remember Moses and the Israelites going through the Red Sea, surely this miracle makes for one of the top ten, and very soon later they are dancing around a golden calf. Faith does not always grow on the back of miracles; it is normally there before the miracles often in small dosages and it then more than often grows in that phase, and often a long phase between human deadline and heavenly deliverance, and true faith keeps on growing even if there is no heavenly deliverance. Notice the difference this time! Instead of "What kind of man is this?” as we see in our text for today, this time they say: "Truly you are the Son of God". God usually ignores our human deadlines to increase our faith for this very reason. Let’s focus on this as our second reason. After Jarius' daughter is raised from the dead, Matthew 9:26 (ESV) says: “26 And the report of this went through all that district.” That phrase is repeated over and over through the accounts of Jesus' miracles. Something that does not impress me are the stories these TV evangelists concoct of health and wealth and just how they got it. I shared with you a while ago about the poster of this pastor and his wife inviting people to their church. He stands with his hands around her and both hands are filled with the biggest gold rings, with one aim in mind and that is ‘join us and you will have bling’. What impresses me is the testimonies of believers going through absolute defeat and have come out with victory: maybe not with health and wealth, but have come out with the assurance of Christ's presence every step. To me, that's a great testimony! I shared this song with you before, but let me read you the words again form the song of Scott Wesley Brown "When Answers Aren't Enough There Is Jesus"
Do you realise that of greater importance than your physical healing or your financial provision is your soul. At times God can keep somebody down and down and down, until there is a true breaking to repentance and salvation, and then He can still keep you down to prove if it is there or not. We all know that many people turn to the Lord just to get their needs taken care of. Part of the delay, then, is God's divine love that is so much greater than our human desires. And I think we become more compassionate after we have been through that time between human deadlines and divine deliverance. My compassion for people who are unemployed increased three years ago when I lost my employment. Our compassion for people with children born with defects increased when our eldest was born with a clef lip and pallet, my compassion for people with cancer has increased now on the back of our present experience and so I can go on and on….. So church family, let’s learn these simple truths over this period as we consider God and our deadlines and realize that He ignores our human deadlines to increase our compassion, as well as our faith, our vision of Him, and our testimony. 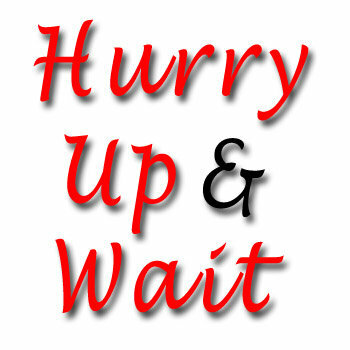 God is never later, but sometimes He sure is slow, so hurry up and wait!